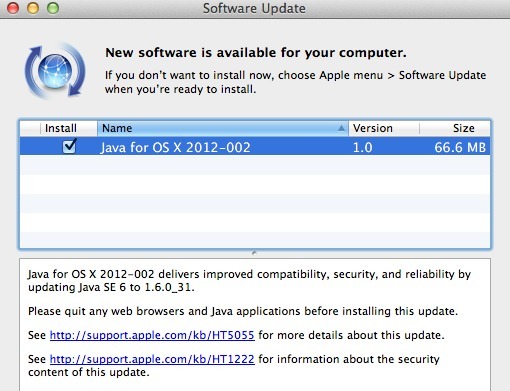 Apple has released its second update in two days to the OS X implementation of Java. The first update closed a vulnerability that has led to the infection of more than 600,000 Macs via a trojan horse. The infections have received increased media attention in the past day, including a splashed headline on the Drudge Report. While yesterday's Java for OS X Lion 2012-001 update closed the vulnerability in Java 1.6.0_29, there's no indication what the new update -- called Java for OS X 2012-002 -- fixes. The update notes link to the same support document as update 2012-001. Last year, Apple introduced a security update to OS X that would automatically remove malicious software from OS X installations. It isn't clear if the infected machines can be fixed via the internal OS X security mechanisms. In OS X Mountain Lion, the next version of the OS X software that will be released this summer, Apple will include a feature called Gatekeeper. The new system relies not only on Mac App Store distribution as means of vetting apps, but also on a new "identified developer" program under which developers distributing their applications outside of the Mac App Store can register with Apple and receive a personalized certificate they can use to sign their applications. Apple can then use that system to track developers and disable their certificates if malicious activity is detected. It's also Friday the 6th right now. Does this mean the world's going to end again? I don't think I can take another world ending; I may die of laughter. Hi. Can you guys tell me whether you think my Macbook got infected? Yesterday I did a search for "msnbc live feed online." Two of the results were websites called zahipedia.info.com and the other epctv.com. I can't remember which of the two it was (I think the latter), but, when I went to it, a small window popped up telling me that I should clean my computer of junk. I clicked OK to get rid of the window, then Safari froze up. I couldn't even quit it until I forced quit it via Finder. Could this have infected my computer? My Macbook is fairly new and, as far as I know, free of junk. Is epctv a dangerous site? Why did it tell me I had junk? How would I find out if I got infected? Thanks. By the way, laws of computing 101: The OK button agrees to something, the Cancel/close window button disagrees. If you click OK, know what you're saying OK to. EDIT: In other words, stop using it to close windows. Straight from Apple's Java mailing list. Just an issue with Xcode and App Loader in OS X Lion. Snow Leopard users don't need the tiny update. Today we re-shipped our Java 1.6.0_31 for OS X Lion today to address a critical issue we found in Xcode and the Application Loader tool. This new "Java for OS X 2012-002" package is effectively identical to "Java for OS X 2012-001", with the exception of a few symlinks and version numbers. For the sake of expediency, we have re-rolled the automatic update as our standard full combo updater, with the hope that most users have not yet been presented with 2012-001. We considered creating a delta update for users who already installed 001, but that would have made the process of getting these fixes to you take longer. We apologize for the inconvenience, and would like to offer our thanks to the developers who caught this issue and reported it to us as quickly as they did. This issue only impacts Lion users, so Snow Leopard users have nothing to reinstall. Over the next few days, we will catch up with producing updated release notes, tech notes, and developer packages with the revised 002 version numbers. yay patch! something oh so satisfying when you download a new patch, I just love them! It's not unknown for a company to patch a patch if they discover the first patch had issues - just off the top of my head I can remember past instances where Microsoft, Apple, Adobe, and Mozilla did that. You can copy and paste the two commands into Terminal. To open Terminal, go to Finder>Applications>Utilities>Terminal. Double click on Terminal. Hit enter after each command. Just be careful when using Terminal. It's one of the few places where you can really mess up your computer. So eventually all software will have to be downloaded from the App Store. Jail-broken Macs? Who would have thought it. No, just turn Gatekeeper off. Its just there as protection for the uneducated. Are users of Snow Leopard effected by this latest attack? I'm running Snow Leopard, too. When I ran software update (just a few minutes ago) all I had to download was a 7.9MB update for some type of camera. I suppose that Apple will get around to addressing the older OS's as soon as they can. What was this attack doing to computers? And lastly, are the iOS devices also effected? Yes, SL is vulnerable even more than typical OS X Lion users, because SL had Java preinstalled. Apple removed it in OS X Lion like they did with Flash a year or so ago so users have to go to Adobe's site to get the latest version. Are you sure you haven't downloaded it yet? I just updated my old MacBook Pro with Snow Leopard and it was in Software Update.app. Check /Applications/Utilities/Java Preferences and make sure the version is 1.6.0_31. The vulnerable version of Java is 1.6.0_29, I believe. Probably not infected, unless you surf a lot of shady sites. Go here: http://www.f-secure.com/v-descs/trojan-downloader_osx_flashback_i.shtml and follow their manual removal instructions. If you follow steps 1-3 and skip to 8 and you get those two error messages, then you are NOT infected. Also if you use OS X 10.7 Lion and didn't download Java, you should not be infected with this trojan. If you use Lion w/ Java installed or Snow Leopard (10.6) which comes with Java preinstalled, you will want to follow those F-secure instructions to check if you have the trojan. Don't forget to go to Safari>Preferences>Security tab>unclick "Enable Java".